I got up early in the morning, when the sun was also yawning on his bed, and was so angry to God that he turned red completely; but when he felt the freshness in the air, when he saw that the flowers were smiling, the yellow petals are sprouting, that the birds once again were determined to reach new heights, that all the mothers were looking with love at him, he also smiled, and thanked God for a new day. Smiling rays of sun entered the homes of people as a signal that the new day has begun, that the birds are chirping sweetly, and that the blue sky is waiting to get himself painted with the love and happiness of the people. I got up from my bed, went outside and closed my eyes to feel the freshness in the air, to listen to the silent sounds of nature, the hissing of leaves and the distant sounds of birds, to touch the warm rays of sun, to thank God for the beautiful day. When I opened my eyes I saw that all the trees, birds, flowers are waiting for my smile; I smiled at them, and they return back the smile, and the day kicked in. People started going to work to earn money for themselves and the family, keeping in mind their duty towards nature; and that the money is only the medium, and somewhere deep in their heart they know that, one has to smile with nature, have to be in harmony with the people around to live a happy and peaceful life. I reached office on time, and found that my boss is giving a never-seen-before smile; that smile was enough for me to start the day’s work with new energy. After the day at office, I again saw that the sun was completely red, and was once again angry to God that the day has come to an end, but then he glanced at the ever shining moon, and became satisfied that moon is there to take care of the people, who love him so much ,and take care of him. I reached home, after the day’s work, and smiles of my dear once, gave me comfort from the tiresome work. 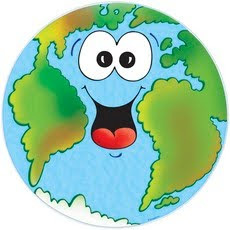 I smiled back at them, and thanked GOD for the day at SMILING PLANET. ‘What If I get to live my complete life on Smiling Planet, far from the people, to whom life is a race, to earn money, and to come first. I think you are looking at life with a positive mind, which I believe the right way of living. Nice post! That would be a wonderful what-if -- a smiling planet and a calm, peaceful life in it. :-) . Innocent and positive. Liked it..
thanks,am happy that you liked it.. Thanks for the wonderful comment..